While I was looking at paintings of ladies in light blue dresses, I thought how challenging it would be to try and sew some of the dresses, like the one in the above 19th century painting, and the one in "The Shell" by Bouguereau, seen on the left side of this blog. Both garments consist of a blue dress worn over a white blouse or dress. 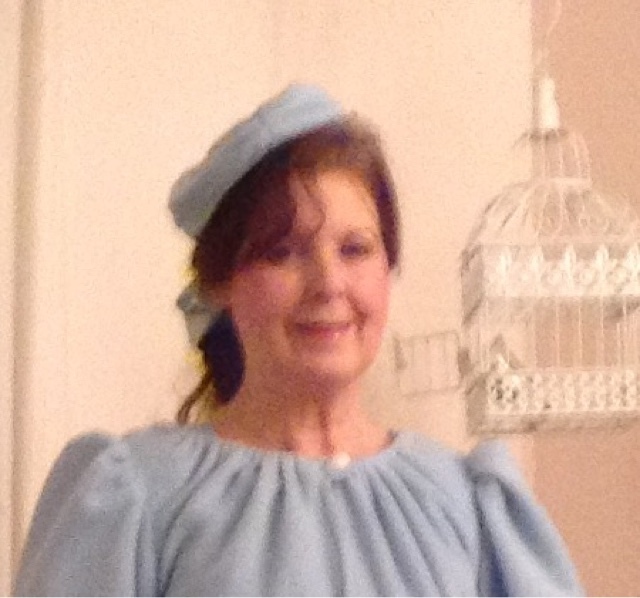 I finished the China Blue dress and jacket but the photos of me, wearing it, were very blurry, so after I have checked the settings and dressed up again in the blue outfit, I will add better photos to this post. To describe this fabric would do it an injustice. 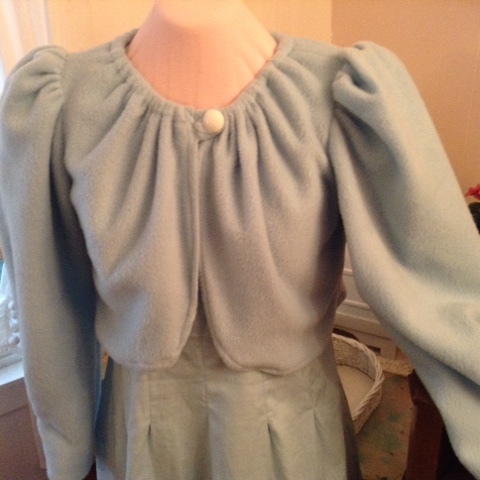 It is cotton by Waverly, silky yet linen-like, as you can see the grains, and a dream to sew. It comes in all colors, so just in case there is a shortage, I think I should get some more! Here Is the dress without the jacket. It is composed of pieces from several old patterns, so I cannot show you the pattern. I plan to get more of this fabric and make another style, or two piece outfit from one pattern. On the dress-form the skirt area looks slender but it is quite a full skirt. I was not able to drape it to show how big the skirt really is, but it is quite a swirly, twirly skirt. Below is the pattern envelope of the jacket, printed in 2011. I have saved this pattern several years and finally got around to sewing it. It is not available in the stores anymore but you might find it online. The jacket is made of fleece, a synthetic, but I successfully sewed it with a machine needle for woven fabrics. In fact, it worked better than a ball-point needle designed for knits. Here are the hat ingredients. I still have the purse cut out and a fascinator hat in the works and maybe a pair of fabric-covered shoes. If I finish them I will add pictures to this post. This is not the clear, cornflower blue, but has a bit of aqua in it and is more a muted shate-- more dull than a previous light blue I have sewn. It hearkens to a color worn in the 1940's that I have seen. However I like it quite well. Time - I bought the ingredients before January 20 but have worked on it a few hours at a time since then. About 18 hours total. I see why stitchers charge such high prices, as it is time consuming and a lot of work. 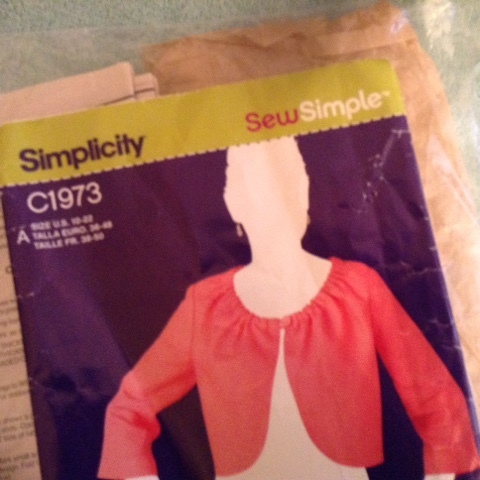 One thing that will help, is choosing a very easy pattern with no zipper or buttons and very few or no tucks and darts. I will sketch a pattern I once had, with no set- in sleeves and was very easy to make in all prints and colors. It is not so much the pattern, but the fabric which makes the dress interesting. I will try to include a water color sketch of the idea I had for this ensemble. The photos were disappointing, but this one was redeemable enough to use. It does not really show all the aspects of the dress and accessories, for example, the sweeping circular fullness I added into the skirt area. It is hard to catch a photographer when I need one, and it seems more difficult to get anyone to take a picture when we are away from home, even when we are all together, so even blurred photos are okay. The main point here is the color and the design. As you grow older, too many horizontal lines and changes in color and prints on the same garment, or extra trims, seem too fussy. That is one reason I make dresses rather than separates. Separates, unless they match color and texture of fabric perfectly, visually cut the figure in half, thicken the waist (with all those layers meeting at the middle), sometimes make the closet more complicated, and make it hard to decide what to wear with what. A dress is a complete garment and can stand on its own. I mentioned growing older, but I think you can still dress youthfully and wear things the younger ladies would also enjoy wearing. I think we have to present ourselves in a good way to the young if we are to ever teach them about good principles of design, art and the dynamics of clothing in life. What I am doing here is trying to keep a feminine look without cluttering the dress. I will wear this in church, sometimes even shopping, and at home with an apron. I hope to make an apron to go-with and show how to match up the color with a print. I Will try to get the painting posted here later. 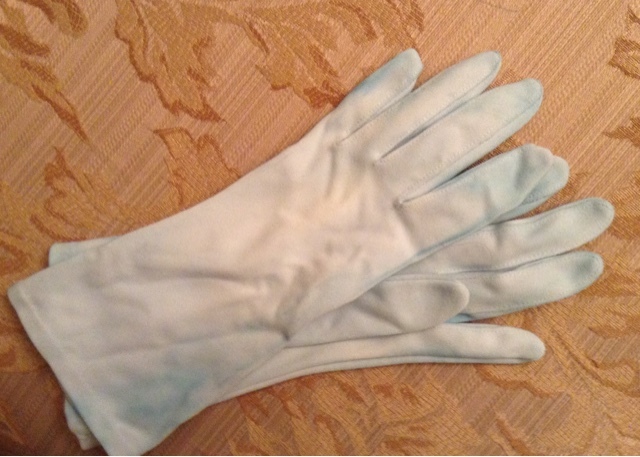 Did you notice the old gloves? 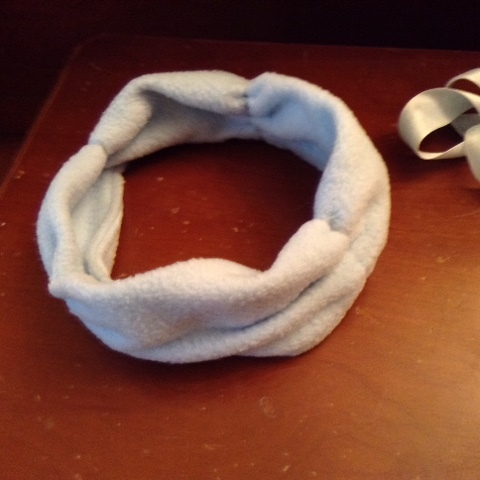 A whole roll of ribbon was looped back and forth, with the ends used to secure it in the middle. Then it was hot-glued to a metal clip. You have heard of "messy up-do's" and this is my new invention: a messy down-do! Those of you who want to see recent posts and cannot see any updates on videos, please be sure to put your email in the subscribe section on the list to the left of this post. 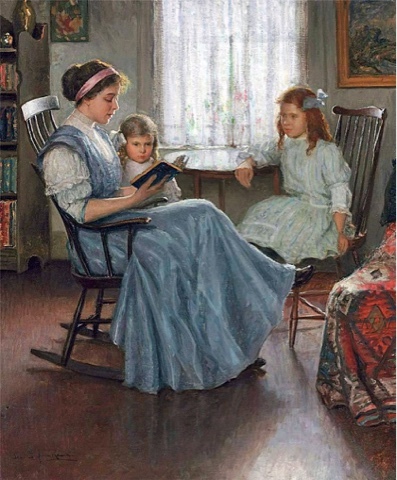 It is beneath the George Clausen painting of the girls arranging roses, and says "Receive Home Living in your inbox." The gloves were from a collection of gloves I have from Stan's Mum and antique stores. 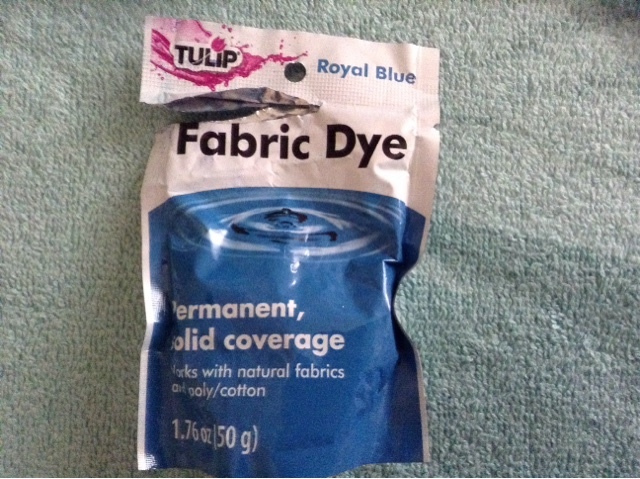 I bought this dye at Walmart craft and sewing section, and sprinkled a little of each color in a small bowl of hot water from the kettle. 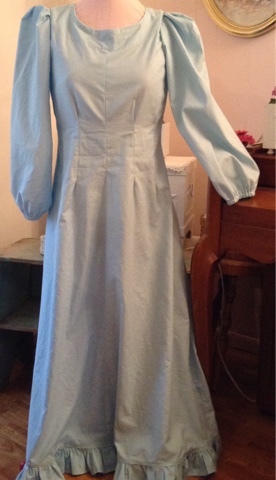 Then I dipped pieces of cheap white muslin in it until the color seemed to match the fabric of the dress. 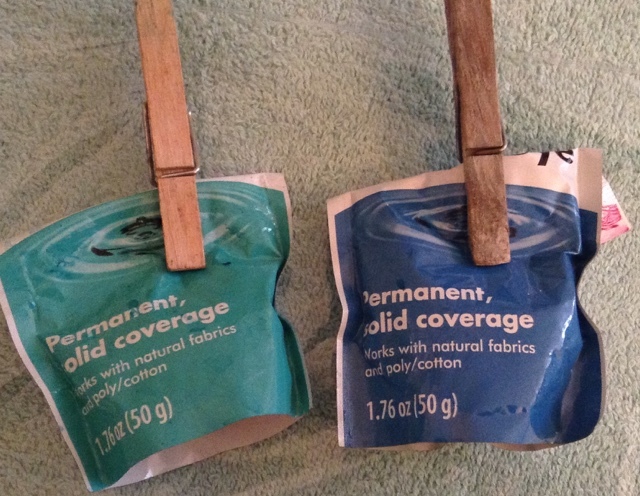 Since I tore off the top of the pale green dye packet on the left, the title of the color is gone, so I can't tell you the color. In a future post I will demonstrate how to find the straight grain in fabric and determine the different qualities by pulling out a thread and seeing how long it is. This should never be done in a fabric shop, but at home with your own fabric. You probably wonder how I can work in this mess. I organize it each time I get ready to sew. Those two pictures of pink dresses are from The Paragon catalogue you can get free in the mail. They are made with velvet and silk; fabrics I do not sew because of the extra time it takes. Cotton is more stable and the machine sews them with ease. I like the color and style of those dresses and will adapt them to sewing with cotton fabric. You have to read carefully on the pattern envelope about the recommended type of fabric for a pattern because some fabrics are woven more loosely or firmly and the dress can end up not fitting well. 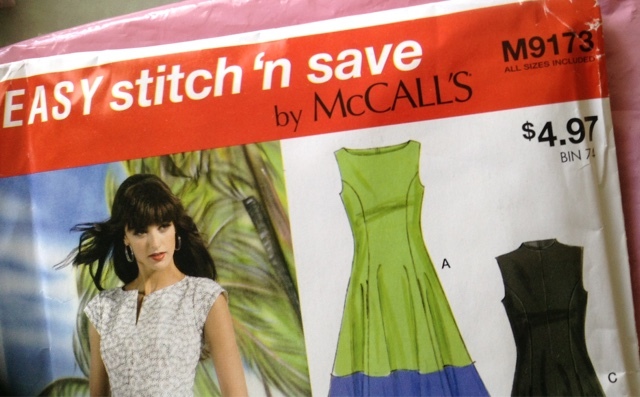 I found this McCalls pattern at the Walmart sewing area after I had already sewn the dress. It has the high neckline I was looking for. I will try it on the next dress. I think $5.00 is too much to pay for a pattern, but I keep missed ng the 99 cent sales at fabric stores. As for a recommended sewing machine: you just need a new one every so often, but not an expensive one with all the bells and whistles and fancy stitches. However if I ever got the opportunuty I would get a Jenome, which I think is made in Georgia or Alabama. I used one in someone's home and she said they do not break down or wear out. However I suppose that depends upon the workout the stitcher is giving it. People say having a cat for a pet helps you feel calm, but I do not sit stiil very much and that would make a cat nervous. 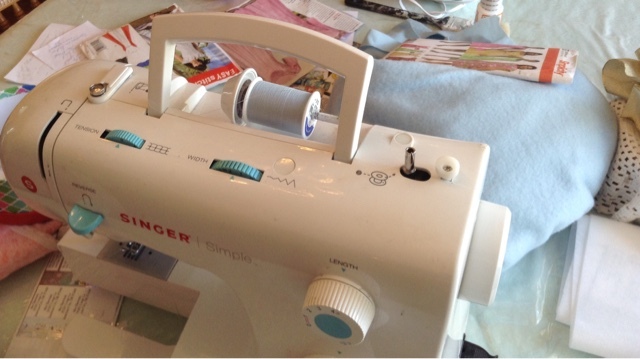 People say a certain sewing machine is best, but my use of it would not be average use and it would break down earlier. What a lovely dress. Is it a particular pattern, or did you put various patterns pieces together? The bottom picture shows how lovely this is when worn. I think it is a good idea to have an hour or so a week, designated for 'playing with fabric'. Simply that. I find it slowly develops more confidence to try out new ideas and re-discover long-lost creativity of the past. It is much more satisfying. Well, what a pretty dress, And yes with the jacket or without looks very nice! so glad you love to sew, because finding these kinds of dresses are impossible. Maybe one day the designers will come out with some of these elegant and pretty designs for the homemaker. We need some casual ones for the everyday and extra special for church and special occasions! Look forward to seeing a water color of it! Anonymous, yes it is from several old patterns . You can join foreign pattern pieces easily as long as you match up the seams and central dots and some of the notches. 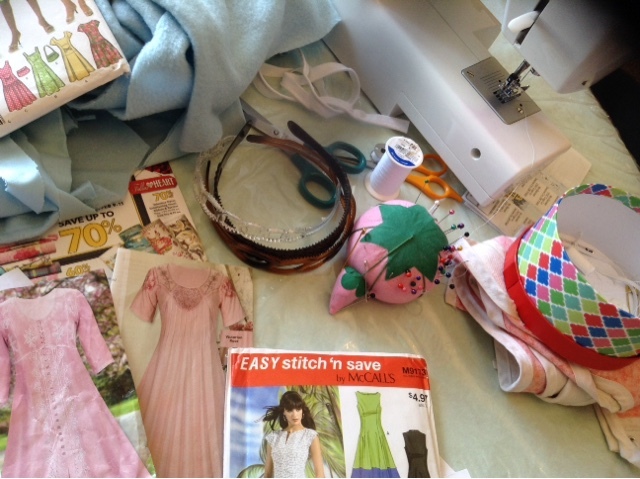 Dear Budgeteer....I really like your idea of an hour a week for playing with fabrics! I've never seen a jacket like that before. It's so simple and feminine. And it looks easy to make, too. I like your rendition of Melania Trump's dress. The fabric looks very cozy and comfortable. You look stunning in blue. You have such a sweet face and your hair pulled back with the bow really sets the dress off will. The gloves were the perfect finishing touch. I have often used mix and match patterns to make other garments. It is fun and creative. Thank you for sharing, Janet. Good idea having another setting for this dress. How beautiful Lydia. . 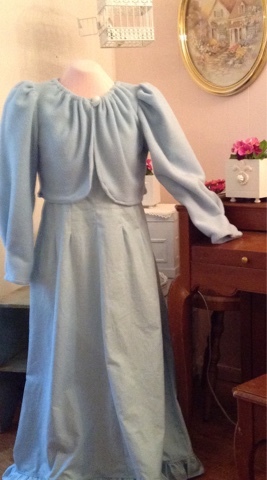 Your soft blue dress with matching accompaniments. 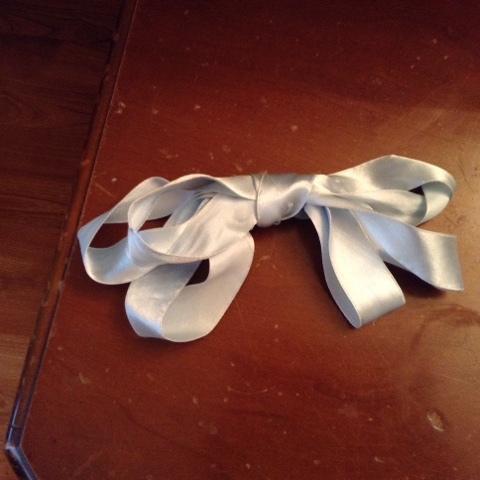 And the ribbon adds so much finesse. Very lovely and feminine. .